Belted Galloways or Belties as they are sometimes known are awesome cows and quite rare in North America. They are super hardy in the cold and snow thanks to their thick curly coat and centuries of cold rainy Scottish weather in Galloway where they are from. 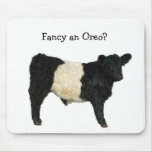 These Oreo cows are quite intelligent, nosy and love their food! They are naturally a grass or pasture eating cattle, and feeding them grain doesn't make them grow any faster. That's why this historic cattle breed is so scarce but is such a favourite on hobby farms and small holdings. 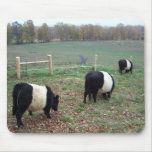 Belted Galloway cattle are a dream come true for a hobby or heritage breed farm or smallholding. The calves are vigorous and calving is relatively easy for the cows. The breed are naturally polled which means they have no horns, making them safer for less experienced farmers to handle. The cows are gentle and mild mannered! 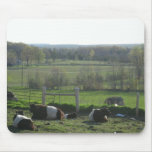 For small farms selling farm produce at farm gate or have a Bed and Breakfast or part of the local ecotourism movement, a herd of balck and white Belted galloways on a green pasture makes a great statement. As well as being very little trouble, but productive as well, these cows are cool looking and look great on brochures or on a website for visitors to see. Where does the Belted Galloway Stripe come from? Galloway cattle come in a number of colours from the silvery Dun, to creamy White, glossy Black and the dark gingery Red. Most people don’t realise all of these colours can show the white belt markings. The Galloway breed of cattle are centuries old and it is thought that the easily inherited (dominant) white band comes from a possible cross from another rare old breed, the Dutch Belted dairy cow. At first glance the Dutch Belted cows look similar to the Belted Galloway but are more finely boned, slender and have a shorter, smoother coat. You have had a little glimpse of these unique and beautiful beasts. A herd of Belted Galloway cows are stunning in a green pasture. You may not realize, Belties are actually easy to see in the dark or in the middle of a snowstorm as the stripe makes them stand out really well! 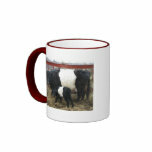 Certainly the Beltie gifts make a wonderful unique present for somneone who loves cows, or farm animals. Check out the cute gifts that illustrated our article today! The great thing about Zazzle is all itms are shipped locally to reduce shipping fees, and coolest of all is you can customize them with your name or any messages you like! If you want to learn more about them! 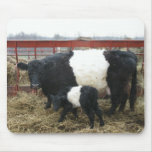 Belted Galloway Cattle Society page has great info on the breed and how hardy it is. Another great resource for USA Belted Galloways. They call them Belties more often! 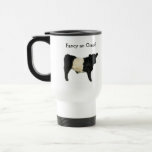 More unique and lovely Zazzle Gifts for rare breed farmers and farm lovers. 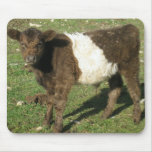 Tell me about cute Belted Galloways you have seen! 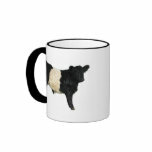 Is there a Beltie herd near you? 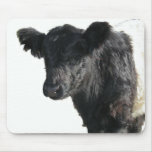 I love cows they are so adorable, love your Zazzle products. I have these types of caws and i show then too! Hi Dusty toes, and thanks for the comment and vote! I read some of your helpful zazzle articles and since taking your poll a few weeks ago, I am happy to say have made my first and lots of sales and am thrilled. 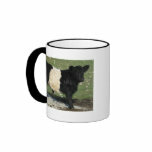 People love these cute beltie cows, and I do too. Hope your holiday season is good in the store! Oh I love your cows with the white middles and curly hair. Very interesting breed of cattle - and I know nothing about cows of any kind. It looks like you have a beautiful farm. 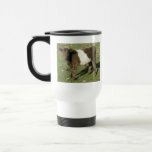 Good luck with your Zazzle store!